ModuleWorks, the leading supplier of CAD/CAM components for toolpath creation and CNC simulation is happy to join the consortium for the European Twin Control project. The first of October saw the start of the European project Twin-Control, an alliance of eleven European partners that aims to design a new concept for machine tool and machining process simulation. The project will last for 36 months, has a total budget of 5.6 million euros and is partially funded by the European Union under the European Framework Programme for Research and Innovation, Horizon 2020 (grant agreement No. 680725). Twin-Control is a new concept of machine tool simulation because it unifies the different concepts that affect the machining process, combining advanced simulation models and including vital aspects in today’s industry, such as maintenance and energy efficiency. In addition, it will allow for the integration of the actual machine state in the models, increasing productivity through model-based control and even assisting with predictive maintenance actions. 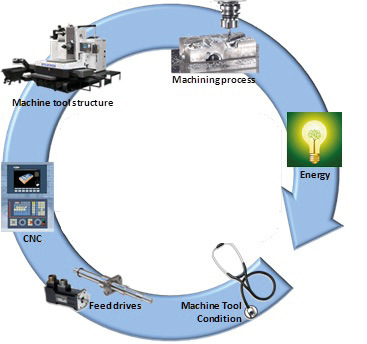 In short, machine tool users will be able to use the technology resulting from the Twin-Control project to better control and optimize their processes, thus improving productivity. The results will be validated by two key industries in Europe, the automotive and aerospace sectors, and additional demonstrations will be conducted in three leading pilot lines. The consortium is made up by the following members: IK4-TEKNIKER (coordinator, Spain), the University of Sheffield (UK), Samtech S.A. (Belgium), Technische Universtiät Darmstadt (Germany), Predict S.A.S. (France), Artis GmbH (Germany), ModuleWorks GmbH (Germany), Gepro Systems S.L. (Spain), Mecanizaciones Aeronáuticas, S.A. (Spain), Comau France S.A.S. (France) and Renault S.A.S. (France). ModuleWorks’ contribution to this project will be their knowledge and expertise in process simulation and integration. The partners will get access to the ModuleWorks process data as an interface to the material removal simulation to advance the simulation detail and accuracy with their process expertise. ModuleWorks will also support the integration of the Twin-Control developments into commercial CNC-Controls. The results of this project will be integrated into the ModuleWorks product portfolio and therefore made available to a wide range of possible industrial applications. For this transfer ModuleWorks will coordinate the exploitation management in the project consortium.